Medieval Byzantine fashion and costume era. NOTES ON THREE ICONS. BY LEONARD WHARTON. 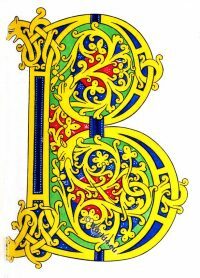 This entry was posted in 12th Century, 1916, Byzantine, Genre, Russia and tagged Artist, Byzantine fashion era on 4/19/18 by world4. 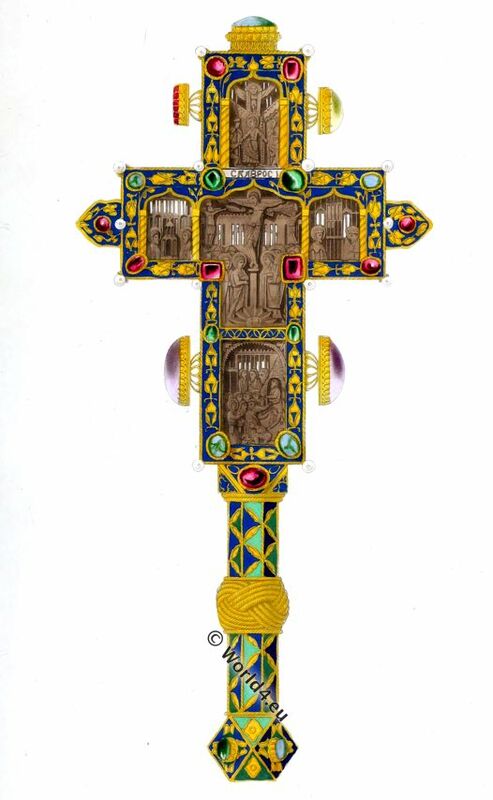 Cross from Mount Athos. Monastery of Caracalla. 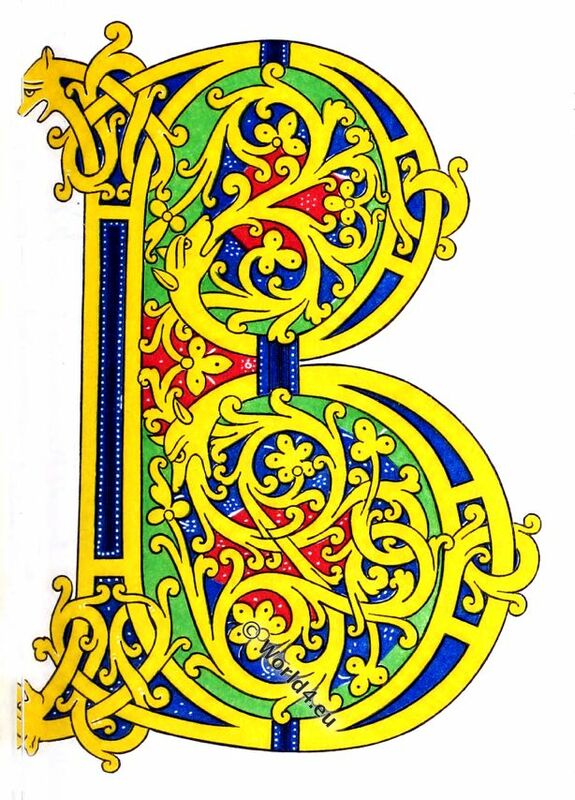 Initial letter B, Manuscript 10th century. BEFORE the Christian era, Mount Athos was celebrated for the length of its shadow (ingenti tellurem proximus umbra vestit. Stat. ), which was said to reach as far as the isle of Lemnos, for the multitude of its hares (quot lepores in Atho. 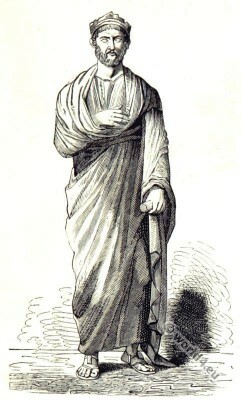 Ovid. ), and for having been the scene of one of the most wonderful exploits of Xerxes, who in his invasion of Greece is said to have cut a passage for his ships through the lower part of this vast mass of mountains. This entry was posted in 10th Century, Byzantine, Ecclesiastical and tagged Byzantine fashion era, Henry Shaw on 1/30/17 by world4. 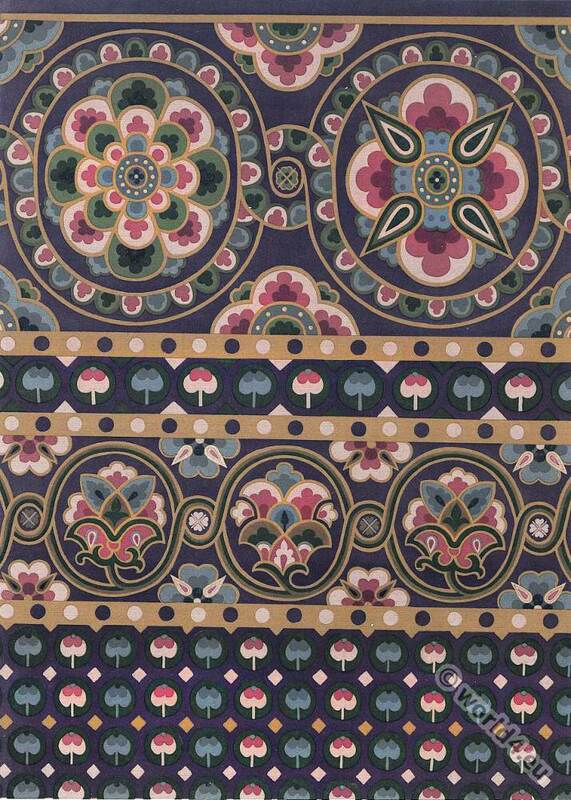 Byzantine silk fabric made in tapestry art. 11th century. 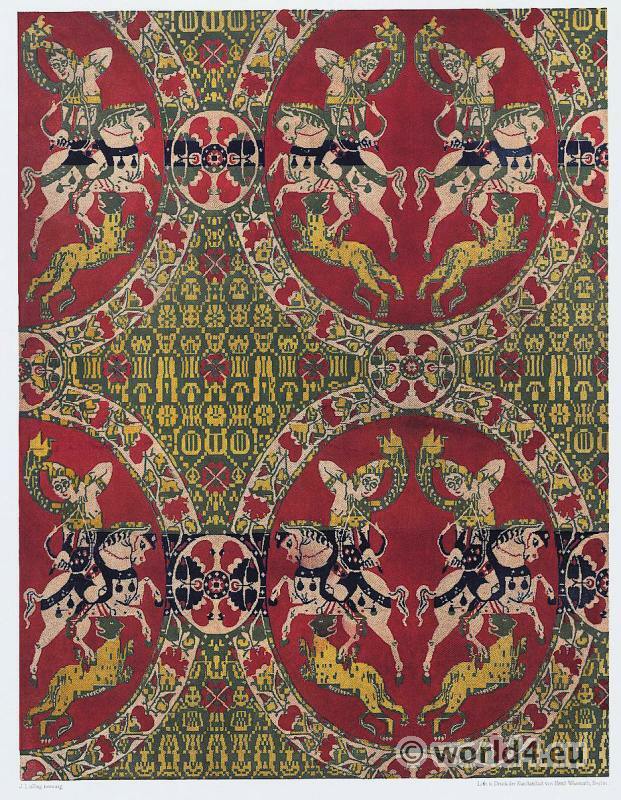 This entry was posted in 11th Century, Byzantine, Ecclesiastical, Fabric, Middle Ages and tagged Byzantine fashion era, Ecclesiastical Dress, Textile design on 11/14/15 by world4. Merovingian Warrior, Bishop, King, Queen. 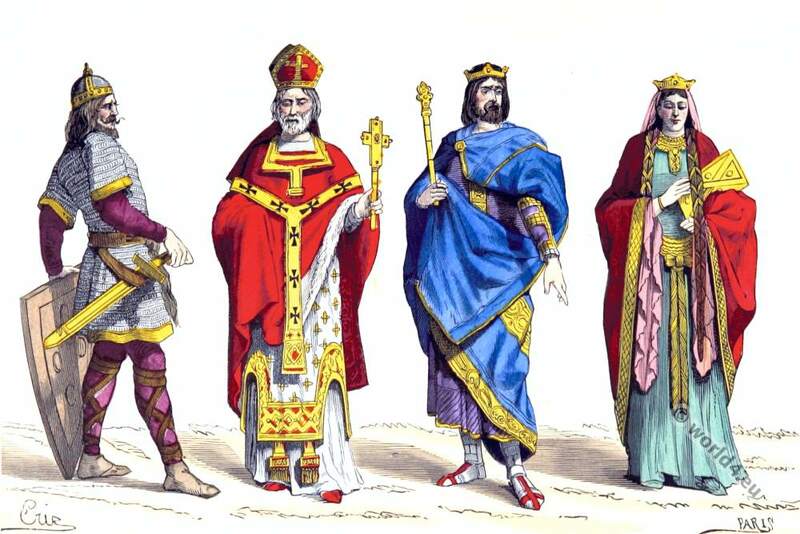 Merovingian Warrior, Bishop, King and Queen. 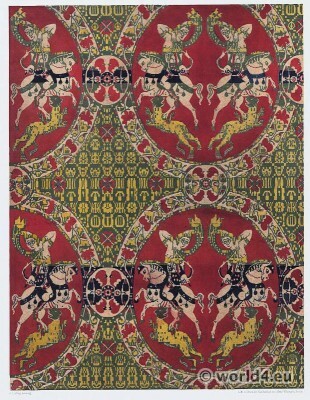 6th century. 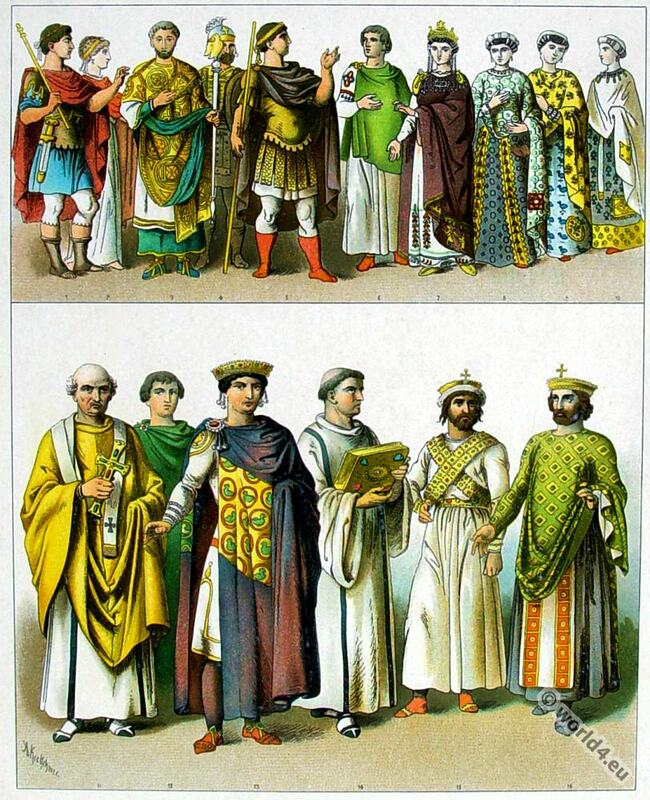 This entry was posted in 6th Century, Ancient, Byzantine, Celts, France, Gauls, Middle Ages, Nobility and tagged Byzantine fashion era, Historical Gaul costumes, Merovingian fashion and history, Paris à travers les siècles on 7/6/15 by world4. Merovingian King in char with guardians. 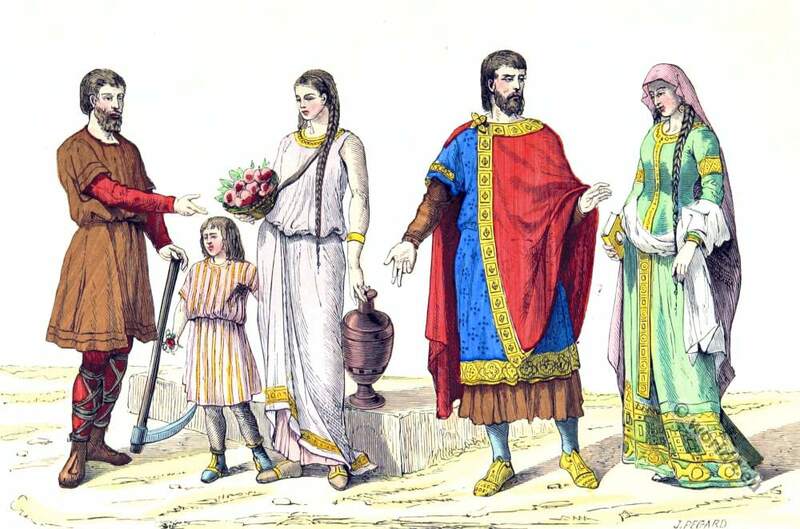 This entry was posted in 6th Century, Ancient, Byzantine, Celts, Gauls and tagged Byzantine fashion era, Celtic, Historical Gaul costumes, Merovingian fashion and history, Paris à travers les siècles on 7/5/15 by world4. Statue of Roman Emperor Julian in 360. This entry was posted in 4th Century, Ancient, Byzantine, France, Roman and tagged Ancient Roman Costumes, Byzantine fashion era, Paris à travers les siècles on 5/19/15 by world4. Merovingian queen costume from the 5th to the 8th century. 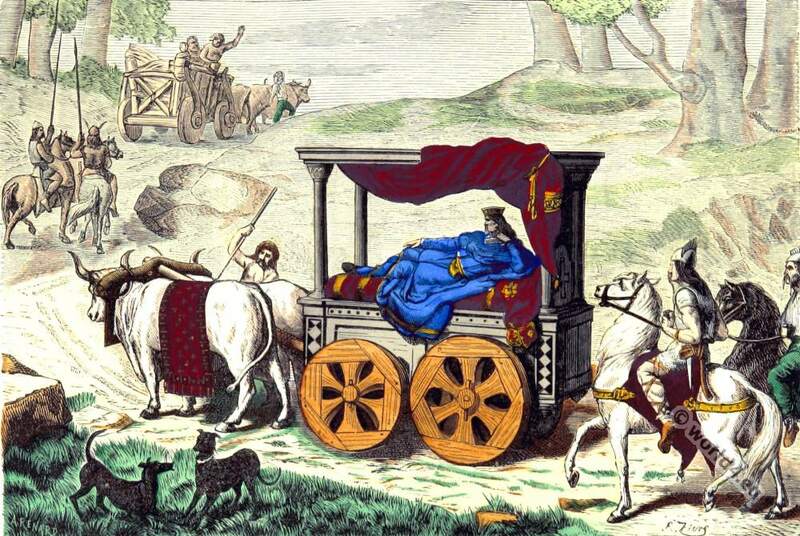 Merovingian queen from the fifth to the eighth century. 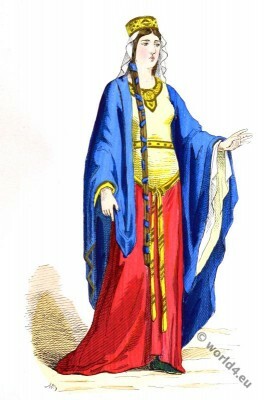 Merovingian queen costume from the fifth to the eighth century. This entry was posted in 5th Century, 6th Century, 7th Century, 8th Century, Ancient, Byzantine, Carolingian, France, Gauls, Middle Ages, Nobility and tagged Byzantine fashion era, Costumes civils et militaires des Français, Medieval costume, Merovingian fashion and history on 2/19/15 by world4. Byzantine empire costumes, 300-700 A.D.
Byzantine empire, Eastern Roman 300-700 A.D. This entry was posted in 4th Century, 5th Century, 6th Century, 7th Century, Ancient, Byzantine, Middle Ages and tagged Byzantine fashion era, Ecclesiastical Dress, Firmin Didot, Medieval costume on 2/11/15 by world4. 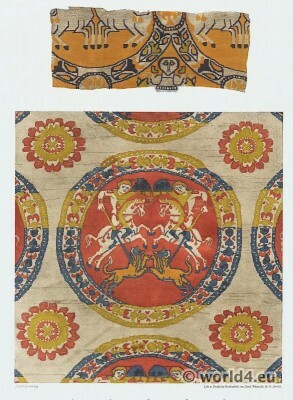 Byzantine silk fabric by the mantle of St. Fridolin 4th to 8th century. This entry was posted in 4th Century, 6th Century, 8th Century, Ancient, Byzantine, Carolingian, Fabric and tagged Byzantine fashion era on 12/30/14 by world4. 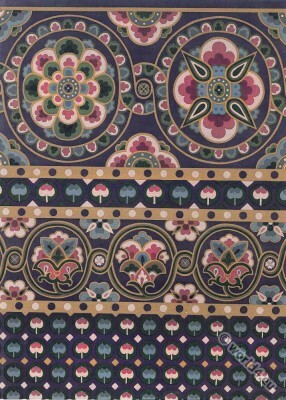 Ancient Byzantine silk fabrics, VI-VII. Century. 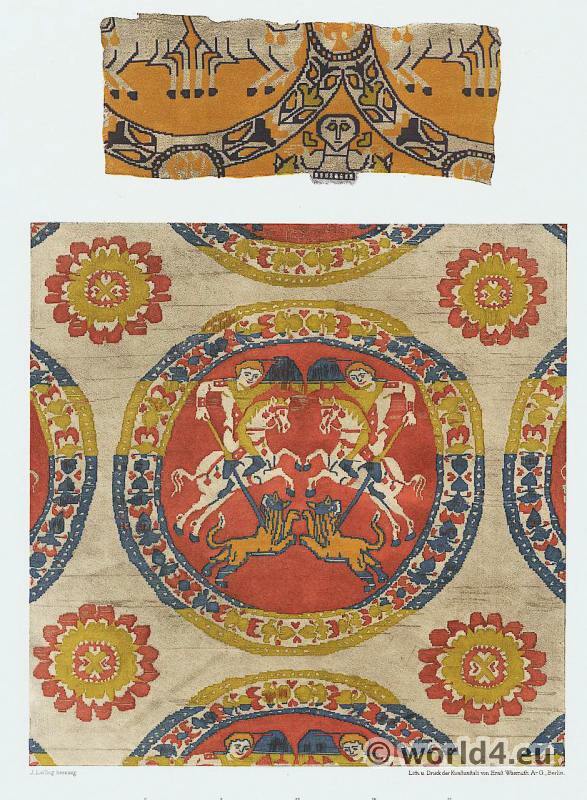 This entry was posted in 6th Century, Ancient, Byzantine, Fabric and tagged Byzantine fashion era on 12/30/14 by world4.